I've been here only twice but I'm already convinced that this is my favourite eating place. 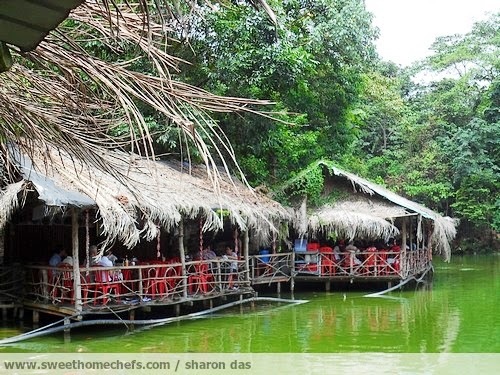 The Thai Veg Fish Farm Restaurant is all about fresh food. The only problem is that it's miles out of town and in some secluded hilly corner. I feel sorry for my little car. On our way out and heavier from a full stomach, she just didn't have the power to take us up the hill. We had to reverse the car back down and accelerate forward. Vroommmmmm...! Phew...made it. Would probably never hear the end of "That's what you get for eatin' too much" if anyone at home knew about this! I've no regrets. If we drove THIS FAR to eat, we should satisfy ourselves thoroughly. Anyway, back to our food adventure. 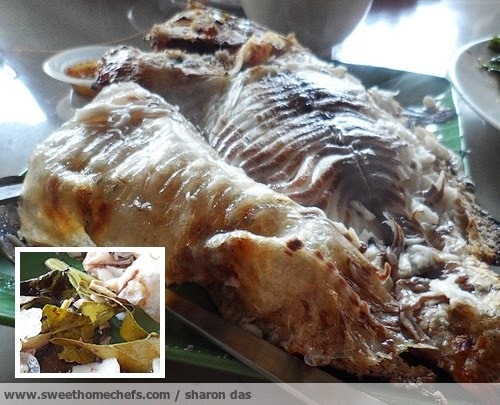 This was one of the dishes we ordered, grilled salted fish stuffed with kaffir lime leaves and a stalk of lemongrass. Mmmm..this was to die for. The aroma and tender meat is etched in my memory. To eat, simply peel off the heavily salted layer of skin. 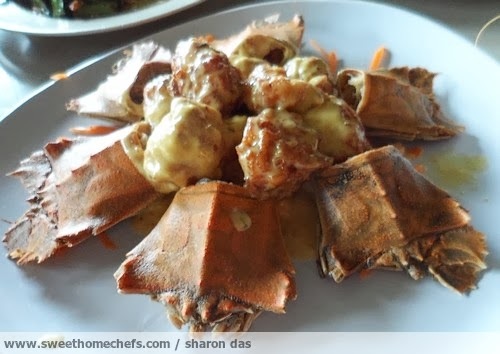 This is another great dish, mantis prawn cooked in cheese sauce. 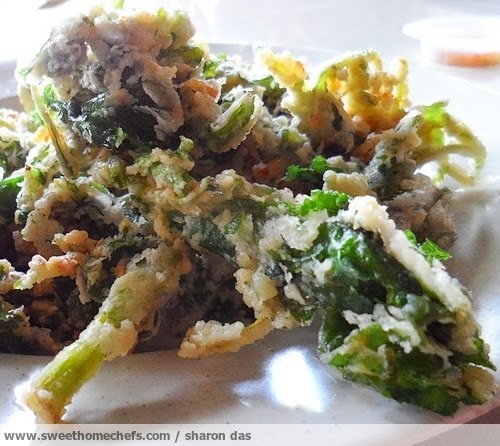 And finally, crispy fried vegetable. This is good snack food. Have I gained anything from this trip? Besides a few kilos, yes. 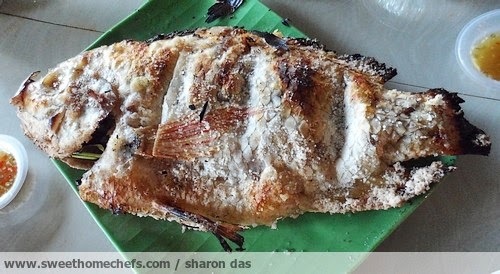 The Veg Fish Farm Thai Restaurant has inspired me to cook a little differently.These are easy methods to improve the taste of food. I'm also taken in by the way food is presented. 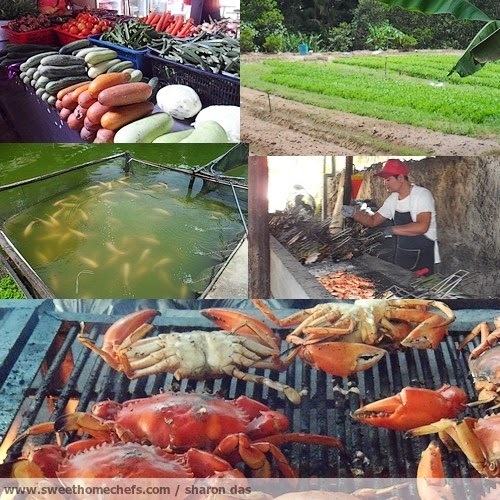 The fish, the farm, the fresh food! Wow, this sounds so good. It must’ve smelled heavenly while it was baking. Surprisingly, it didn't taste salty at all.